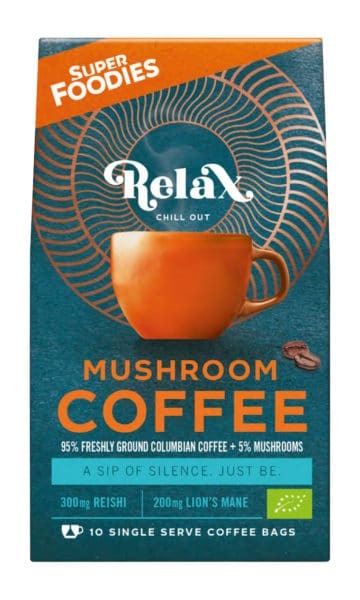 Using 100% organic Arabica coffee, the Mushroom Coffees incorporate 95% coffee with 5% (500g) medicinal mushrooms, and are available in three varieties: Relax, with 300mg of reishi and 200mg of lion’s mane; Focus, with 200mg of chaga and 300mg of lion’s mane; and Achieve, with 250mg of chaga and 250mg of Cordyceps. The coffees come in packs of ten 100% biodegradable coffee bags sealed in airtight, plastic-free sleeves for freshness. The coffee is sourced from a single community of coffee growers from the central Colombia Andes, using Castillo and Caturra beans.